Experience the incredible hospitality of the North Platte World War II Canteen, America's most heartwarming homefront story. 5:00pm - The museum is home to the World War II Canteen Exhibit as well as the Prairie Village. The western prairie village is complete with a working blacksmith shop, railroad depot and telegraph, Fort McPherson cabin, Pony Express Building, county church, one room school house and much more. Stepping into the village is like stepping back in time 100 years. 5:45 pm - Told by a Canteen Historian, Jim Griffin. The Museum features the official North Platte World War II Canteen exhibit, which tells the story of local volunteers who served more than six million service men and women throughout World War II. 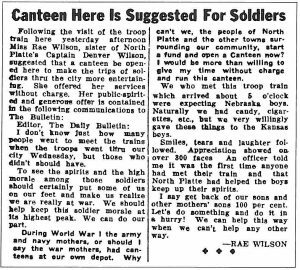 The North Platte Canteen is known to have been the single biggest movement of volunteerism in the United States to date. 6:45 pm - Enjoy good, old-fashioned cooking that may include items that would have been on the Canteen menu. Fried chicken, homemade pies, even a Canteen favorite - Popcorn balls! 7:45 pm - Board your motorcoach to return to your hotel. The North Platte Canteen Experience: starts at $30 per person for 35 people of more. The shootout/robbery, dinner menu, and both tours can be customized for any group. Please email Amanda Connick at aconnick@VisitNorthPlatte.com or call at 308-221-6864 if you have any questions or would like more information.